3-star hotels with a full-fledged restaurant concept. The conviviality and authenticity stand for the brand’s core values so that well-being might be a pleasure for all of us. Nearby the city center and the railway station, the hotel is located very close from the famous Giannada museum, and the Barryland center. All the activities and amenities are less than 5 minutes by feet or by car. Martigny is a very well located in Swiss Alps, between Matterhorn, Mont-Blanc, and Léman Lake. Our guest will find a cosy and design lounge-bar nearby the reception desk, where they can have a good time drinking a local wine or beer, or eating local food like cheese and delicatessen from the Alps. Campanile offers bedrooms with comfort and modernity. Its four-star bedding and its toiletry products guarantee each customer a quality stay. 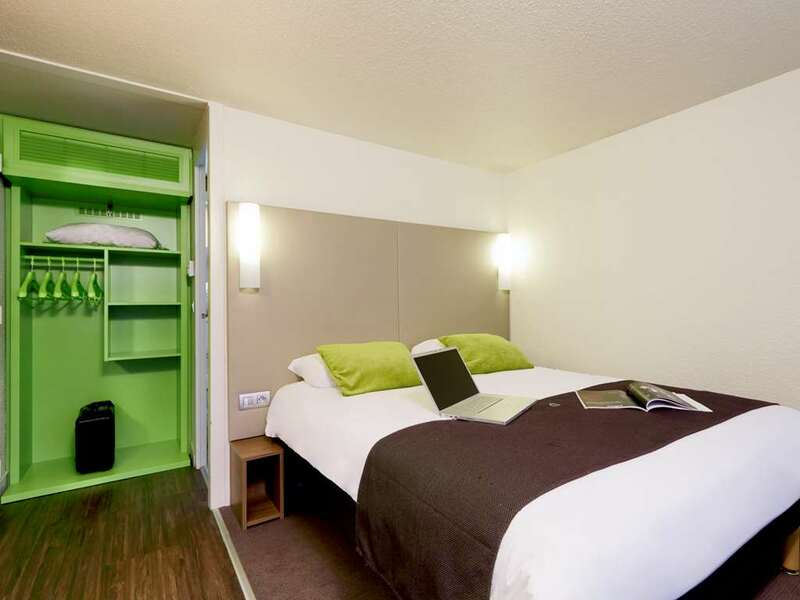 With free WiFi, an LCD screen and a desk, your room can easily be turned into an office. All the rooms are equipped with air-conditioned, an individual set to make yourself a good coffee or a cup of tea in your room. A wardrobe for clothes and a luggage compartment complete the furniture, as well as an armchair to relax on arrival. Each evening, a modern and comfortable lounge-bar offer you the possibility to discover local drinks and fingers food like Alps cheese or typical delicatessen. Many restaurants are located less than 5 minutes’ walk from the hotel, in the city center of Martigny. At the top of the building a typical American restaurant welcomes our guest, with a surrounding view on the Alps. For your meetings, we welcome you in Forclaz room, which is equipped with A/C, large screen and video-projector. We can also provide a microphone and audio-system on request with charge. From Geneva and Lausanne motorway A9, exit Martigny. From Italy and St Bernard tunnel, road 21 to Martigny. From Brig and Sion, motorway A9 exit Martigny. From France and Chamonix Mont-Blanc, Forclaz road To Martigny.